Twice a year, Metro makes changes to its bus routes and schedules. Last week, the agency announced changes coming into effect this winter, including detours to avoid construction and minor schedule adjustments. The most dramatic change is an extension of the Silver Line that will bring bus rapid transit to Carson and San Pedro. The former line 450 was folded into the Silver Line, re-branded as “Silver Line Express” service. The new Silver Line will offer more frequent service to San Pedro, and faster skip-stop service to passengers boarding in other areas. There’s more than meets the eye to these changes. If you look through the new schedules, there are several unannounced cuts – and improvements – on various bus lines. These details were not included in the official announcement, brochures, or social media posts. Some riders who don’t closely study the timetables will see an unexpectedly long wait for their bus. Riders on other lines will find a pleasant surprise in the new service changes, giving them a faster bus ride or shorter waiting times. In many cases, service is being cut on a local line, offset by a service increase on the corresponding Rapid line. For instance, Metro is cancelling 36 trips on line 45 down South Broadway, which is going to decrease the frequency of service. But the agency is adding 38 trips 745 Rapid, which services the same route. That route will now run every 12 minutes on weekdays, up from a 22-minute headway. Similarly, Metro is reducing service local service on lines 4, 28, 60, 180, 181, and 204, while increasing service on lines 704, 728, 760, 780, and 754. The trade-off here is that passengers who board at local stops will see increased waiting times, but Rapid riders will have faster trips. On lines 751 and 18, service is being increased with no corresponding shifts in service on other lines. Other lines, including the 207 on Western Avenue, will see buses run less frequently. On this particular route, service is being reduced by 10 percent. Local buses will run every 10-12 minutes in the morning rush hour, down from every 6-8 minutes. Over the past few years, bus ridership on Western has declined. According to The Source, one of the ideas behind the schedule changes is “shifting some bus service hours from low-ridership lines to higher ridership lines.” Bus ridership is in slow decline system-wide, even on some lines that are getting service increases, so it’s not clear exactly how these decisions were made. Another way service is being reduced is by turning buses back early. On the west end of line 2 on Sunset Boulevard, most “short line” buses will turn back at Beverly Drive instead of at UCLA. On the east end, several runs that used to go all the way into downtown L.A. will turn back at Alvarado Street. New schedules indicate that Metro is making the same kinds of cuts on the 704 and 720 as well. An important change that will impact Metro’s customers is bus stop consolidation. On several lines, certain bus stop are being removed. Once this is done, the remaining stops will be no farther than one-quarter mile apart. At most, the people who used to use those stops will now have to walk an extra block or two. Metro tried to minimize negative impacts on riders, saying “the idea here is to eliminate stops that are already used infrequently and are close to other stops.” Stop thinning like this is often unpopular, but can significantly speed up bus service. Bigger changes to L.A.’s bus system are just around the corner! Next time, Metro is proposing a much larger package of service changes. Public hearings start in February. Axel Hellman is originally from beautiful Montclair, New Jersey, a town whose official marketing slogan is “where the city meets the suburbs.” He is currently a graduate student at USC studying urban planning, and is interested in bike, pedestrian, and transit issues. I don’t take the 450 very often, mostly on weekends, but when I do take the bus from Union Station to San Pedro, the connection at Harbor Gateway seems to be very unreliable. If this change will eliminate the transfer, then it seems like a good thing to me. Hopefully, a typographical error, but it’s in the timetables. 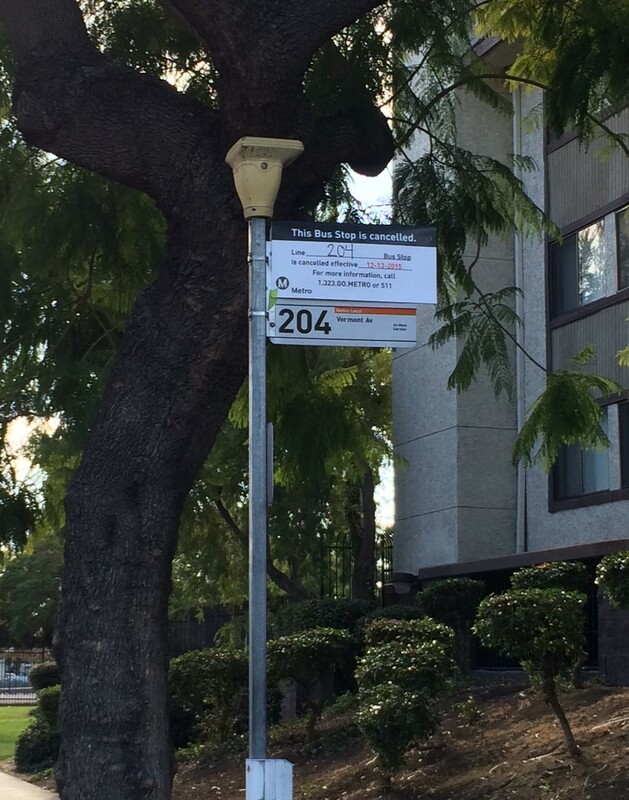 You are right that the change seems inconsistent and buses still originate at Le Conte. I know that Metro is closing its garage in Venice and moving some of its functions over to the one in West Hollywood, which might be somehow related to this. This may encourage me to try the new Silver Line Express to San Pedro. I haven’t been to Ports of Call in a while. Could be related, I noticed ground breaking on some property just east of the Hayden Tract in Culver. Apparently its Metro owned land, it’s significantly larger than Division 6. They might be consolidating the west side operation. If this is what I am thinking of, it was sold some time ago and has nothing to do with Metro. http://www.loopnet.com/Listing/13403915/3475-S-La-Cienega-Blvd-Los-Angeles-CA/ It was originally supposed to be the new Division 6 but that was positioned as a land swap, where the old Division 6 would be changed into apartments while new Division 6 would be moved to La Cienega. Needless to say, Venice residents whined about the additional density. Ultimately, the proposed LAX Division was supposed to be the replacement for that, until that was swapped – as Metro has decided to hold bus service flat for the foreseeable future, with Division 13 opening (next to Twin Towers Jail) there should not be a need for more bus operating facilities anytime soon. Well there is LADOT 142, which has operated along that corridor for years (and has its non-standard numbering to back when Long Beach Transit operated it). that’s definitely the property, I didn’t know it changed hands… In any case, something is going up there! Unusual for a ground breaking to be so undocumented, I guess that’s why I assumed it was municipal facility. So is Division 6 closing or not? At this stage, no. They need a yard to run bus bridges for Expo when it opens, and they plan on putting their electric buses there so there is no issue of noise or gas. Division 6 has no CNG fueling so buses go to Division 7 (West Hollywood) to fuel. The connection was always unreliable because Metro doesn’t increase service on the connecting lines. Metro just kept increasing the Silver Line’s service even though delays in its long route still mean that people are still stuck at Harbor Gateway from 30 minutes to 2 hours depending on the time of day. As someone who’s taken the trip down 110 south for the past decade, this 950X is really impractical as filming at City Hall (happens every so often these days) and the turn onto Flower at Central Library always adds to the Silver Line’s delay compared to the 450’s route. I got to hand it to Metro though. When they first started the Silver Line, they told us that they wanted to discontinue the 450 and have everyone ride the Silver Line instead. We had told them don’t do that and now they finally found a way. Had they not consolidated the 445 onto the 450, this would’ve never happened. Apparently, all of the Metro 45c buses were moved out of Division 6 Saturday morning and moved to other divisions. The only buses still remaining there are buses that are waiting to be retanked because of expired CNG tanks. That’s what Metro did for San Gabriel Valley customers, but at least those people have the alternative of the Silver Streak. A Silver Streak-like overlay running San Pedro-Financial District would probably make sense, but the Harbor Transitway has always gotten fewer riders than the El Monte Busway so that would be excessive service. As Metro is considering turning over the buses that run east of the 605 freeway in the SGV to Foothill Transit, I could see a day when the Silver Line runs San Pedro-Union Station and the Silver Streak runs Staples Center-Montclair. The problem is that Foothill’s CEO is allergic to running shortline buses, which is why you have an excessive number of empty buses eastbound between West Covina and Montclair most evenings. Is it really so hard to use normal people language? At the La Cienega property, they are building a parking lot as we speak. I thought it odd, since there didn’t seem to be a building to serve. You have to remember, that the MTA is, was, and ALWAYS WILL BE, ANTI-BUS RIDER! When more money is put into rehabilitating old train depots, and bicycle storage buildings. then into bus lines, THAT shows you that the MTA DOES NOT CARE ABOUT L.A. COUNTY BUS RIDERS (and the “proposed” June, 2016 Service Changes are MORE OF IT!). Most of the MTA bus riders are NON-U.S. citizens who CANNOT VOTE, and therefore can be trampled on as the MTA sees fit! Its a wonder ANYONE rides the MTA anymore! Even with the traffic jams in L.A., driving in a car, and fighting for a limited parking space will STILL beat an MTA bus line-assuming there even is one! And the trend shows there isn’t! Take a look at the June, 2016 “proposed” (which ARE gonna happen!) Service Changes! The 190 and the 270 are being ELIMINATED! NO LACMTA buses will run EAST of El Monte Station! NONE! That’s sickening, but also explains why it didn’t get much attention. I pass by almost daily on the train and there’s a 2 story garage just north of that lot that seldom occupied. Yeah, I just learned that Metro shut down Division 6 and redistributed the buses to Divisions 7 and 10. Having a dedicated electric bus division would be nice, but actually raises Title VI concerns since the riders that would get the new shiny electric buses would be more White than the general rider population, without having to deadhead the buses to the nearest concentration of minorities in Inglewood and South Central Los Angeles. The Route 2 change makes no sense at all. Why does Metro keep complicating the system ? Very user-unfriendly ! Are there very many white riders at all ? Might be a non-issue. This is late but: the San Pedro-Union Station route was the original route for the 445. The “Silver Streak running to San Pedro to Financial District” was the 450 prior to implementation of the 950X. Metro eliminated all its Rapid routes from the south going to Union Station when they implemented the Silver Line. They broke all those routes into Silver Line & a connecting bus. It’s really bad because it forces people to drive to the Harbor Gateway Transit Center because waiting for the connecting bus is horrendous (service to the connecting buses of those original routes have been reduced every time there is a major change). Essentially, really, for everyone south of city, “Going Metro” is saving money but wasting time.